I love these images. And users like these are why Reddit is still a site worth going to (just unsubscribe from bad subreddits, subscribe to the good ones) in spite of some of its overall silliness. 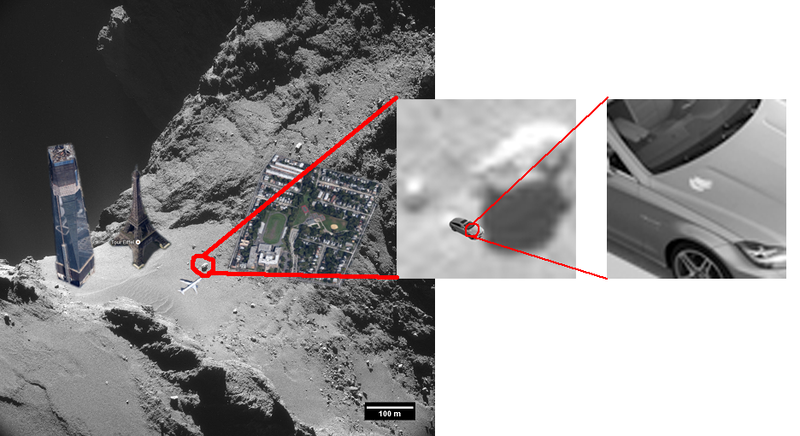 The image is a close-up of comet 67p, with the Freedom Tower, the Eiffel Tower, an airplane (doesn't say what kind, probably a Boeing 777 or Airbus 320 kind of size), a car, and a banana. Oh, and a neighborhood block. The reason for the thread in the first place are the presence of sand dunes (look under the Eiffel Tower), which is a very cool thing to see on a comet. And by the way, Dawn is now just 2.8 million km from Ceres. Both dreading and looking forward to winter at the same time is a very odd feeling.